Learning Experience (LX )Design can help shape the future of education by connecting the worlds of design and learning. It’s a combination of the creative and disruptive talents of designers with the passion and expertise of educators aimed to design better learning experiences. 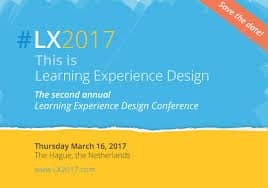 That’s why on March 16 LX Designers from around the world will gather at LX2017 in The Hague. Meet up with designers, teachers, educational experts, scientists, publishers and others who are, just like you, looking for better ways to learn.